Buy my book "The Cheesemaker's Apprentice"
Why should you make cheese at home? 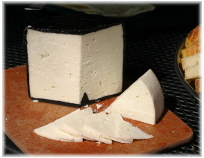 If you enjoy hobbies like canning, pickling, or making beer and wine, you should consider making cheese at home. New to the idea that you can make your own cheese? Here are some of the questions (with answers) that are often asked. A few easy cheese recipes.